Et Lechem Chu'keinu Tein Lanu Ha-Yom. From the DVD series, "Behold the Man"
This is a good Jewish prayer, beginning. "Aveinu she ba Shamayim. . . . " (Our Father in Heaven) . This is hardly surprising since it was given by a Jewish Rabbi to his Jewish disciples. 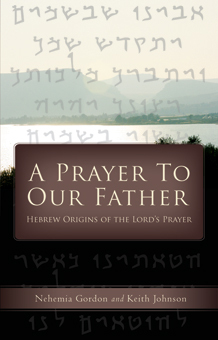 For an exciting read and a thorough exploration of this Avinu Prayer ("Lord's Prayer" / "Our Father" prayer. Get this new book. A Prayer To Our Father by Nehemia Gordon and Keith Johnson. Join these two men, one a Jew and one a Christian, as they seek the heart of the prayer Jesus/Yeshua taught those who followed him. Seek out their Facebook group for pictures of the locations mentioned in the book. Hebrew Insights to The Lord's Prayer from Christine Darg on Vimeo. Was the Gospel of Matthew Originally in Hebrew? from Christine Darg on Vimeo. Book obtainable from www.aprayertoourfather.com - Buy a copy for your pastor too. Interestingly, the origin of the Hebrew word for "to pray" is l'hitpallel , meaning to judge oneself. (David Stern in his commentary on 1Corinthians 11 v27-31) Remember Jesus' parable about the two men who went to pray. A Siddur (plural siddurim ) is a Jewish prayer book. It has the Hebrew and the vernacular side by side for those whose Hebrew is not so strong. To hear Jewish prayer, visit Virtual Cantor.com for a complete resource of MP3 recordings. The most important Prayer is "Shema Yisrael" (Deut 6 v4-9), which is recited morning and evening, and before going to sleep. This is the scripture which is contained in the Tefillim ( the small boxes containing scriptures, which are worn strapped to the forehead and on the arm ) at morning prayers as well as his Tallit Gadol ( prayer shawl). When a man dies, he will be buried in the Tallit in which he prayed in life. 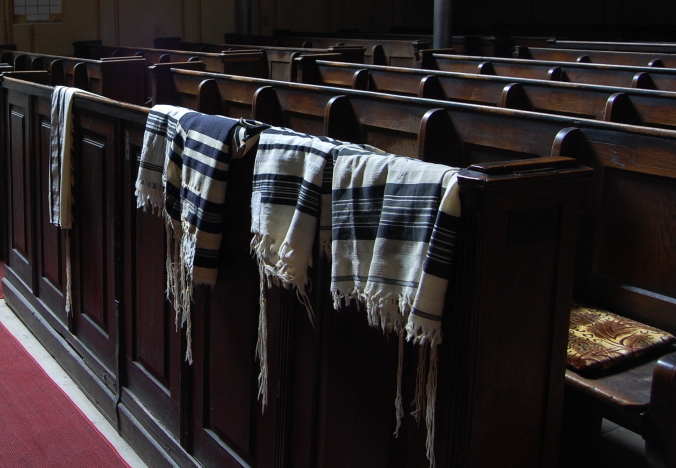 Although some Jews have small Tallits, the standard Tallit is large enough to be a shroud. The Tallit is fringed at the ends and has special tassels on the corners ( tzit tzit) . These were originally attached by blue cords, and are a reminder to keep the commandments. (from the commandment about having tassels on the corners of your garments (Num 15 v37-41)). It is said by some that the tassles and fringing on the tallit has 613 knots - the number of the mitzvot (commandments). That is the "Ten Commandments plus the other 603. The knowledge about the exact colour was lost and the tassels are now white, but the blue thread is remembered in the blue stripes which are the usual basis of the design of a prayer shawl. These blue stripes form, with a "Star of David", the flag of Israel. When a man puts on his tallit for morning prayers, he wears it with a the diadem at the top; near his forehead. The diadem is a strip of decorated fabric sown half way along one of the long edges, which carries whatever motifs are used on that tallit. A Diadem, according to the dictionary, is 1 a crown or headband worn as a sign of sovereignty, 2 a wreath of leaves or flowers worn around the head, 3 sovereignty, 4 4 crowning distinction or glory. This raises interesting questions, as does the fact that the Tallit is not worn on Tisha BaAv, the day of mourning, as it is a sign of glory. So why the diadem? Remember that the Jews were chosen to be God's nation of priests, and that the high priest wore a diadem which proclaimed "Holy to YHVH". Putting on the Tallit is, perhaps, an acknowledgment of this responsibility? The blessing for putting on the Tallit is, "Blessed are you, o Lord our God, Ruler of the universe, who has hallowed us by your commandments of putting on the tzit tzit"
Observant Jews wear a Tallit Katan under or over their shirts, with the fringes showing at belt level. Magnified and sanctified be God’s great name in the world which is created according to God’s will. May the kingdom of God be established in our life and in our days, and that of all the house of Israel, speedily and soon. And let us say: Amen. May God’s great name be blessed for ever and ever. Blessed and praised and glorified, exalted and honoured, magnified and lauded be the name of the Holy One, Blessed be God, though high above all blessings, all hymns and psalms which we can utter. And let us say: Amen. Let there be abundant peace from heaven for us and for all the people of Israel. And let us say: Amen. May God who creates shalom - peace and wholeness - in the universe, create peace for all humankind and for all Israel. And let us say: Amen. * Nehemia Gordon discusses the Kadish in chapter 14 of "SHATTERING THE CONSPIRACY OF SILENCE" and examines the tradition of saying Kadish to raise a departed loved one's soul to a higher spiritual plane. It is notable that Jewish prayers at mealtimes and special events have a different emphasis from some Christian's prayers. The Bracha or blessing that Jesus said before distributing the loaves and fish in Galilee and before sharing the bread and wine at the seder in the Upper Room were prayers of praise to God; blessings of God for his power and goodness. They were certainly not requests that God do something to the food in the partaking of it. Jesus did not bless the food; he blessed God. Blessing becomes confused with "doing something for" if we are not careful. If this happens it is confusing when we come to think of our purpose being to bless God, since we usually spend our time asking God to bless us. See the blessings for lighting the candles, and for bread and wine in Passover, Pessach and the seven beautiful blessings which are part of Jewish Weddings to get a feeling of the attitude of worship. "The LORD bless you and keep you. The LORD make his face to shine upon you and be gracious to you. Shema blessing, from the beginning of the Shema prayer. Praise his name whose glorious kingdom is for ever and ever." Most English translations use the word "LORD" where the name of God appears in the Bible. The Name of God is read by Jews from the Hebrew scriptures as ADONAI, meaning Lord, and the Complete Jewish Bible prints it as ADONAI, following the capitalisation principle in other English translations to denote the Name of God. However, Where LORD or ADONAI are used, the scripture actually reads - YHVH - the name of God - not any title like Lord.